Together is a multicultural picnic day for the gay, lesbian, bisexual and transgender communities coming up on Saturday 8 May. Performers from different cultures will appear on the day, including a choir, a gay Asian dancing group and a multicultural drag show. The aim of Together is to bring people into a shared space to celebrate the diversity of the community. Organisers say they want the day to contribute to a more open and caring gay, lesbian, bisexual and transgender society. ACON is supporting the picnic, which will be held at Darlinghurst’s Green Park from noon. SSOnet will run more details on Together in the coming weeks. The Sydney Leather Pride general meeting will be held this Saturday 17 April at the Pride Centre, 104 Erskineville Rd, Erskineville, from 2pm. Board members will discuss the upcoming Leather Pride Week and plans for this year’s Inquisition party. 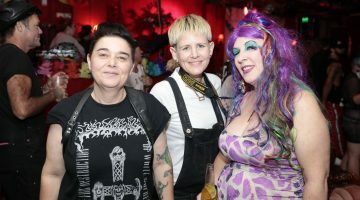 The ever-busy Canterbury Bankstown District Gay and Lesbian Social Group (CBD to its members) is starting a new activity on Saturday 24 April. The CBD Swim and Gym Group will meet regularly to exercise in a fun and friendly group environment. For more details, contact CBD on 9773 4331 or email cdb@cdbgl.com. It’s not exactly gay, but it does affect most of us not living within walking distance of work. And it’s also one of the most infuriating things about this great city of ours. The next free Year of the Built Environment lecture will focus on the future of public transport in Sydney (including, one would suppose, if there actually is one). Murdoch University professor Peter Newman and American transport expert Hank Dittmar will look at making Sydney’s transport system sustainable and, hopefully, less annoying. The talk will take place on Tuesday 20 April from 6:30pm to 8:30pm at the City Recital Hall, Angel Place. Tickets are free but bookings essential. Ring the Hall on 8256 2222 to secure a seat.